Following in the footsteps of DIY meal-kit geniuses like Blue Apron, cocktail delivery subscription services are shaping up to be the food industry's final frontier. The boozy boxes on this list are a far cry from your pop's beer-of-the-month club. Nope, they're meticulously designed by trusted mixologists, loaded with fresh ingredients, artisan mixers, top-shelf spirits, and completed with easy-to-follow recipe cards. Some even come with bar tools, glassware, cocktail-specific glossaries, or mini history lessons, giving at-home shakers a greater sense of appreciation for their homespun hooch. They're like instant cocktail parties in a box (and they also make the best gifts ever). Note: make sure to double-check your state’s alcohol-related shipping laws before springing for any booze-in-box subscriptions -- Prohibition left a hell of a mark. How it works: SaloonBox ships for $37.50 a month, either on a month-to-month or a la carte basis. It's relatively cheap, sure, but the bottles are small, like airplane small, and the kit contains just enough for two different recipes (four cocktails total). 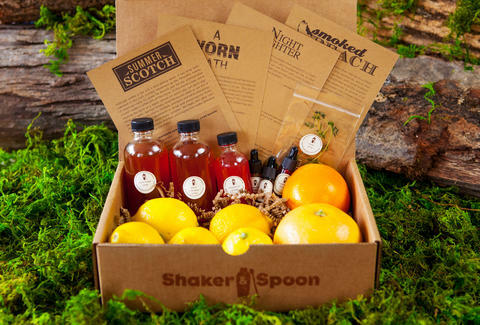 It's kind of like a cocktail starter kit -- if someone's particularly into a certain spirit, they can order a full bottle of the stuff from SaloonBox's partner site, PlumpJack Wine & Spirits. You won't find any fresh fruits or juices in here, but all other ingredients are top shelf, including the booze, and the recipe cards feature background info on featured mixologists. Quality bar tools are available for purchase on the site and are sometimes snuggled into the box as a secret surprise. This one makes a great gift because commitment is literally nil, the price is right, and if the recipient loves their sample-sized delivery, they can splurge for more by their own damn selves. 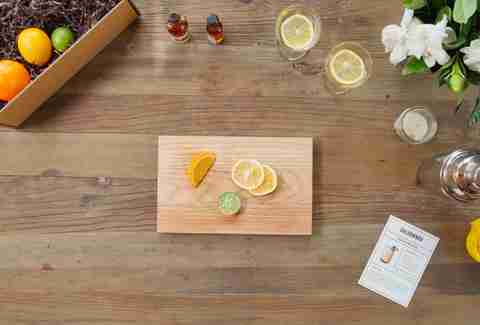 How it works: For a mere $89 per month, this San Francisco-based startup will ship you a big flat-rate box packed with everything needed for a month's worth of cocktail-making as well as a ton of mixology tips and tricks. 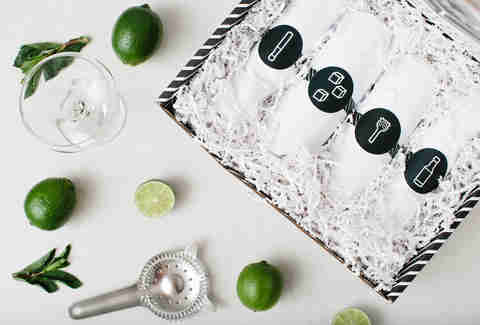 Perishables are never included (BYO fruit), the full-sized bottles are explicitly intended to stock your home bar for future use, and the written components act more like a cocktail 101 class than a party in a box. The coolest aspect of Bitters + Bottles is definitely its trajectory, starting new customers out with bourbon-y basics and then moving along to focus on more complicated spirits like mezcal. It's also a pay-as-you-go service, so feel free to hop off that box car at any point. How it works: Shaker & Spoon's adorable little boxes run $50 per month for a month-to-month sitch or you can save a few bucks by opting for a three- ($135), six- ($250), or 12-month ($480) pre-paid package. There's no actual alcohol inside, but aside from ice and glasses, the rest is all in there, and the inclusion of perishables sets these guys apart. Each shipment yields about 12 cocktails stemming from three (sometimes vastly) different recipes, all revolving around a single spirit. This subscription's great for the DIY-drinks dabbler who fears full-bottle commitment and/or enjoys the freedom of choosing their own preferred liquor brand. Also, S&S' social media photos are fire. 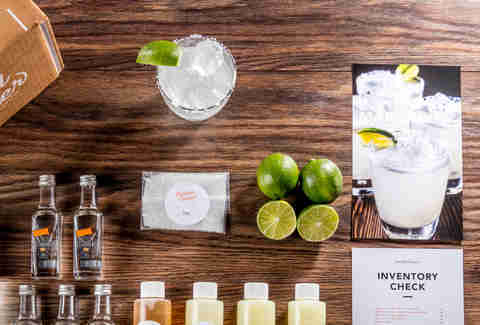 How it works: Crafted Taste is a monthly subscription service with three different tiers that focuses on one bartender-recommended cocktail recipe per box. Paying $65/month (billed on a month-to-month basis) gets you the Mixers Only kit which, as you might imagine, is only mixers. The middle-of-the-road Monthly Kit runs $130/month and delivers all those mixers plus alcohol, and the highest-priced Premium subscription upgrades your liquor from not bad to fan-freaking-tastic and/or throws in some extra goodies for a pretty 200 bones. You can also buy individual kits a la carte off the website whenever the mood suits you. The best part? All shipments come with full-sized bottles so you can watch your home bar grow and grow. 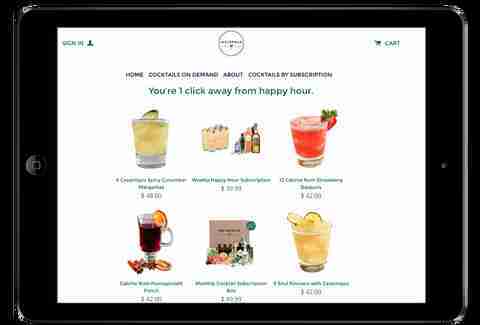 How it works: At Cocktail Courier, subscribers can pick from a variety of delivery times and frequencies (weekly, bi-monthly, monthly), state their preferred liquors, or just go a la carte. Subscriptions are $39.99 per box (as opposed to per month, hence the multiple delivery options), while single kits range in price depending on what's inside. The recipes err on the side of classics-with-a-twist (think: Almond Joyful Old Fashioned, Pineapple Rose Collins), each designed by a prominent bartender to yield four to 12 servings. Base liquors generally fall somewhere between 375ml and 750ml, perishables are always along for the ride, and bar tools are also available as add-ons in case your stash is lacking. You can even buy one-off cocktail kits by the number of individual drinks you want! These guys have truly thought of everything. How it works: Instapour is geared toward the layest of layman cocktailers, people who would otherwise be at a bar but, for whatever reason, find themselves at home, thirsty, and eager to drop a cool $49.99 per month. The stupid-simple set-up (mix, liquor, garnish, tools) cuts way down on prep time, mess, and margin of error, and with eight to 16 servings per box -- it's essentially a pre-fab cocktail party. And there's nothing wrong with that. How it works: Mixology Monthly's model is a bit different from the others in both form and function. Instead of a curated subscription, MM firsts asks members to sign up for its e-newsletter then keep their eyes peeled for each month's special box announcement. Several different single cocktail-focused boxes are released on the first of the month and members (it's free to join) can cop one for $60 per box. The company usually tries to steer a member towards a particular kit based on their preferences, but everyone's free to grab whichever appeals to them. The gear is undeniably sweet, but the included ingredients are fairly bare bones and it's lacking in all things liquor. This is basically the burner phone of cocktail subscription boxes -- but, like, a really, really nice burner. 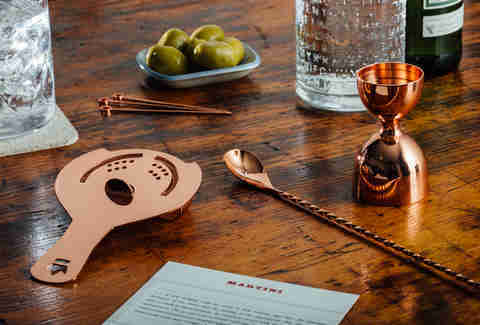 How it works: San Diego-based Speakeasy Co. has it all: ultra-sleek product design, creative recipes, detailed instructions (including links to beautifully shot video tutorials), and fresh, specialty ingredients, plus a bunch of bar tools for purchase just to seal the deal. Customers choose between the Prohibition package (no liquor, $19.99 monthly) or the Speakeasy package (a couple teeny liquor bottles, $34.99 monthly) and can also browse optional add-ons like glassware and featured spirits. 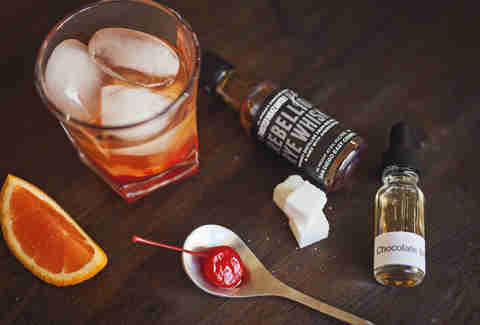 Speakeasy Co. partners with (mostly local) distilleries, barkeeps, and bars to keep things fresh and each kit contains all the ingredients required to make two sets of original craft cocktails. If you're interested in emerging brands and off-the-beaten-path recipes, this might be the starter subscription for you -- and hey, the price is right. Meredith Heil is a staff writer for Thrillist. From the first to the last of it, her delivery is passionate (the whole and not the half of it, forecast and aftermath of it). More at @mereditto.